This is the first real relief hole as the prevailing wind is now helping at last but it still demands accurate club selection into the green. From the tee there are two bunkers on the right to navigate, one behind the other at 200 and 220 yards respectively. Whilst the tiger line is right over the bunkers, the ideal shot is left of the first bunker as the hole dog-legs right at this point leaving a reasonably straightforward second into an elevated green. 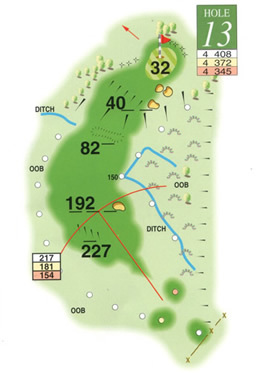 The green has two bunkers guarding the right side and is long and uphill in design, so an extra club may be necessary to reach the flag when sited at the back of the green.